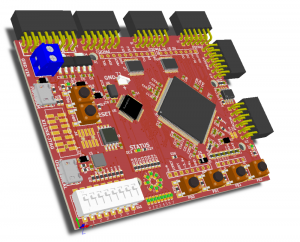 Wavenumber has announced the FPGA MARK-1 – the worlds first maker-adapted FPGA board. The board sports a Xilinx Spartan 6 LX9 FPGA and a small MCU for control. The MCU contains a bootloader in ROM, meaning that you cannot brick the device (unless you release the blue smoke). Headers are plentiful for all your expansion needs. In addition, the board holds four push buttons, 8 DIP switches and 8 LEDs. This entry was posted in FPGA, Platforms. Bookmark the permalink.